Top 10 Reasons To Dress Up As A Pirate for Halloween! Top 5 Reasons To Dress Up As A Pirate! This Halloween, become a sea-wandering scallywag and go as a pirate. It’s Pirate Week at Halloween Alley! Hoist the sails, swab the decks, and prepare your candy sack to plunder some treats this Halloween! Why are pirates so awesome? They’ve got the swagger, the looks, the skills, and the attitude to be the top dog. We’ve got 5 reasons to dress up as a pirate this Halloween! Let’s face it. Half the fun of dressing up as a pirate is participating in fun horseplay with other pirates! Grab a sword and pick a fight to claim the candy booty for yourselves! It’s a dog-eat-dog world out there, but with your pirate outfit and swordplay skills it’ll soon be a pirate-eat-candy world! Pillage and plunder! The best part of Halloween is the trick-or-treating, which is right down a pirate’s alley. You’ll be the master of plundering with your massive candy sack, filled to the brim with your spoils of war. Yaar! Trick or treat, matey! Hand over the Hersheys, or yer be sleepin with the fishes! While costume trends may come and go, Pirates will always be immortal. They’re the ghosts of the sea, the symbol of freedom on the waters. 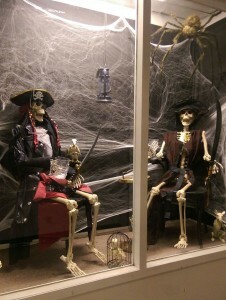 A pirate never ceases to exist-they simply become a skeletons in the afterlife! And similar to that, your pirate costume will never go out of style. It’ll live on forever, just like the pirates! Yo ho ho, matey! Yar not be expectin’ the lingo to make the list? Yer a scallywag if ye think we don’t talk the talk to match how we walk the walk! Ye pirates dictionary has the code for any landlubber who wish to speak as a seafarer. Yo ho ho! Yaar, matey! Swab the decks and pass me gun, tonight we dine on candy and rum! The top reason to dress as a pirate is to mimic the Pirate swagger. Pirates have this daring personality, a mysterious air about them that speaks to our freedom-seeking souls. They’re the top dog of the seas, and it’s easy to see why. They have the confidence, the attitude to get what they want, the skills and equipment to get it done, and the freedom to do whatever they like in the process. Yaar, do what you want ’cause a Pirate is free…you are a Pirate! Agree with arrr list? Let us know on our Facebook page what you think about pirates! For more Halloween updates and fun facts, subscribe to our Twitter page. We also have a Pinterest and Instagram profile!